A debut memoir traces one woman’s pregnancy quest. Kowalski was accustomed to success: she was a corporate litigator by age 30. As a youngster, she wanted kids of her own but, she writes, “somewhere between my rocket-speed career and my jet-setting, single life, I’d completely lost my resolve to have children.” Shortly into her career, however, she was diagnosed with a repetitive strain injury (called thoracic outlet syndrome) and chronic fatigue, which caused her to leave her job and seek alternative therapies, including Feldenkrais and Qigong. Through these, she met Chris, a Qigong teacher and counselor, and reconsidered what she “wanted to do and be in this world.” A healer, she determined, but also maybe a mother. Thus began her convoluted path to pregnancy. “Meticulous” and “a little crazy when it comes to making decisions,” Kowalski wavered about whether motherhood was for her. She tried online dating: a date-to-mate strategy. She explored sperm donation. She took many fertility tests that showed time was running out. Still, she hesitated, went on retreats, and consulted Chris for guidance. Chris’ advice plays a pivotal role, both in Kowalski’s life and in her book. Through Qigong treatment, he knew (or helped her understand) what she truly wanted, the state of her body at any given time, the best sperm donor, whether to consider egg donation, how to handle her anger, and so on. While this spiritual angle on major life decisions is intriguing, Kowalski’s repeated turns to Chris, and the many quotations of his counsel, tend to discount her own story. But the more descriptive, chronological account of her journey to motherhood may indeed steer women in similar circumstances. Kowalski deftly outlines the processes of monitoring fertility, consulting numerous professionals, choosing and using donated sperm, finding an egg donor, and attempting an egg transfer in clear prose and extensive details. She also hints at the costs involved—all useful information. But while the author proclaims a “passion for women’s reproductive rights,” she does not extend her tale significantly beyond her own experience. Women with fewer resources (financial, professional, spiritual) may find her story misses the mark. 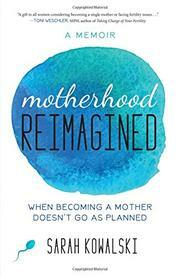 An insightful read for single-by-choice mothers interested in alternative therapies.